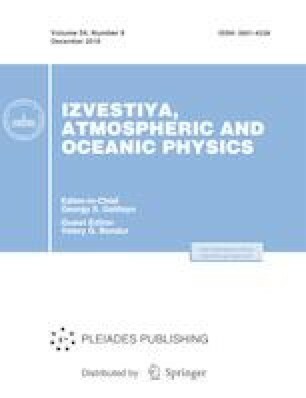 This paper presents the results of an analysis of the phase relationships between the variations of solar activity (SA) with periods ranging from 8 to 13 years and the quasi-decadal variations (QDVs) of zonally and globally average values of total ozone (TO), and some parameters of the lower stratosphere at 50 and 100 GPa based on the NCEP-NCAR and satellite data. Analysis of the temporal and spatial variability of meteorological parameters and TO has been performed by Fourier, correlation and composite analysis for the period from 1979 to 2015 in the 90° S– 90° N latitudinal belt. The TO spectra have basic oscillations with periods of 116–140 months at all latitudes. The oscillations with periods of 87–96 months are also observed at the high southern latitudes. Significant oscillations of temperature and geopotential height with periods ranging from 95 to 102 and from 127 to 148 months are observed in the 90° S– 55° N latitudinal belt. The oscillations of the meridional and zonal wind velocity have periods within intervals of 85–100 and 120–150 months; their significance varies with altitude. The maxima of the TO QDVs advance the SA maxima by 20 months at the middle and high north latitudes and lag behind by 21 months at the high latitudes of the Southern Hemisphere. The lag between the SA and TO variations reverses its sign at 35°–40° S. On average, the phase of the QDVs of temperature and geopotential height within the 90° S–55° N latitudinal belt lags behind the SA variations approximately by one year and half a year, respectively. The phase relationships between the meridional and zonal wind variations and the 11-year SA cycle vary considerably with time and latitude. The quasi-decadal variations of the globally average TO values coincide with the SA variations. The authors express their gratitude to the scientific teams of NCEP-NCAR, NASA, NOAA, WDC-SILSO and G. Bodeker (Bodeker Scientific) for allowing access to their databases. This work was supported by the Russian Foundation for Basic Research, project no. 14-05-00127.